Who called the little Spanish girls little "spinish" girls? Brother Branham's greatest tie to this earth was his family. 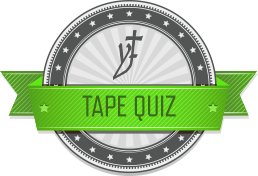 Who were the "tape boys?" "And now, when I put new life in it, I growed and got bigger and stronger, till about _______, and now I put the same kind of life in it and getting older and weaker all the time." Who won't come forth in the resurrection? At what Scripture did Brother Branham begin to read for his subject? "I counsel thee to buy of me _____ tried in the fire, that thou mayest be rich..."
What did the critic say was wrong with the picture the artist painted of Jesus knocking at the door? Brother Branham said, "I'd say, this very day that Jesus has been turned away from _______ of doors today." Jesus has full control once He gets through the first door to your heart. Jesus can be your Saviour and still not be your Lord. "Just as you turn in, after you get into the door of the heart, there's another little door. It's a room that goes into another compartment of the heart. And that little door is the _______." Which door was Brother Branham talking about when he said, "And your creeds will bar that door?" When you let Christ come into that _____ door, then He will open up your _____ sight and show you Himself. What does God have that will open your eyes? Why did Gabe finally give his heart to the Lord? The sign that God showed to Israel was different than the one he showed to the Samaritans and promised the Gentiles. Who was riding in a car with Brother Branham and a Mennonite brother when the Holy Spirit came down and revealed things? Brother Branham calls out a young fellow sitting in the corner wiping his eyes. What did he suffer with? Here are the current quiz results for Door To The Heart. Anyone taking the quiz after Wednesday, March 16, 2011 will not have their score posted.